Review: Dan Piu is the man behind the long running techno label "Moto Music" and also the driving force behind "deepArtSounds". 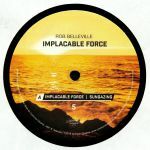 The Alphaville ep is nothing less than a showcase of his signature atmospheric, textured sound that defines his overall production style. Having releases as early as 1997, we're sure you'll enjoy the music from this seasoned veteran of electronic music.